StaMixCo fabricates a wide variety of High Performance & Medium Performance static mixing elements in plastic construction. Sizes range from 1.7 mm (0.067”) diameter to many feet in diameter. Materials of construction include Polypropylene, PVC, Kynar, Nylon and PTFE Teflon®. All of the mixing elements available in plastic are also available in metal construction. Many of the plastic mixing elements are standard stock items with shipment next day after purchase order. The StaMixCo website section titled “2-Component Resin Static Mixers” describes many plastic mixing elements with housings that are designed for use as disposable mixers in the resin processing industry. These identical plastic static mixers are very often used in other industry segments and applications. This website page titled “Plastic Static Mixers” describes the general categories of plastic static mixers that we fabricate which can be used in virtually any fluid processing industry and application such as for general chemical processing, pharmaceutical, food, water & waste water treatment, 2-Component resin processing, etc. Below is an overview of the High Performance and Medium Performance static mixers we fabricate in plastic construction where details are to be found in the below referenced literature. 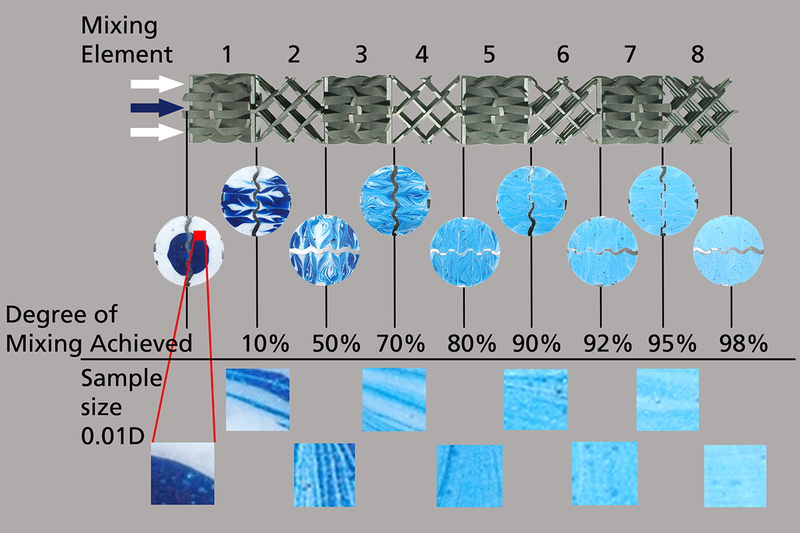 Figure #1: High Performance Type GX mixing elements create a homogeneous mixing in a short length. Figure #3: Type GX plastic mixing elements are available in sizes 1” diameter and larger in PTFE construction and in sizes 3” and larger in Polypropylene and PVC construction. 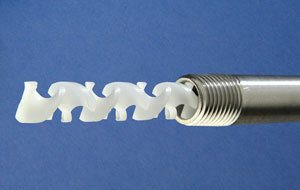 Show in photograph is a 2” diameter GX static mixer with 3-mixing element in PTFE Teflon® construction. Figure #4: The GXR-P plastic mixing elements are available with OD=29.7 mm (1.169”) X ID=21 mm (0.826”) in Polypropylene and 50% Glass-Filled-Nylon construction. The mixing elements are normally inserted into stainless steel tubing. Figure #5: The GXF plastic mixing elements are available with OD=11.7 mm (0.46”) X ID=10 mm (0.394”) in Polypropylene construction. 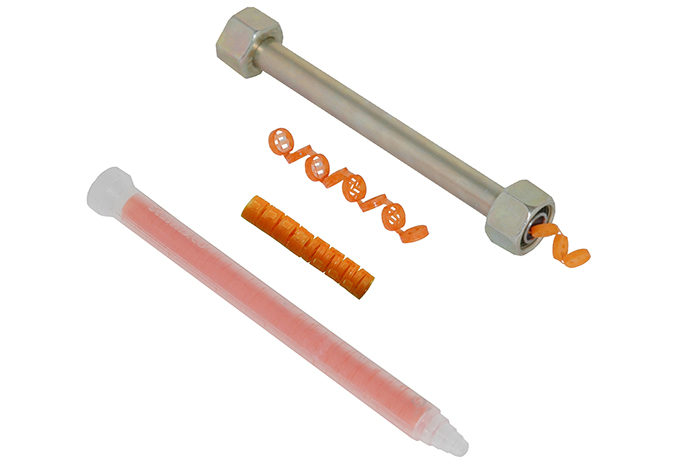 The mixing elements are normally inserted into plastic and stainless steel tubing. Figure #6: The GXL plastic mixing elements are available in diameters larger than 3” in PVC and Polypropylene construction. The mixing elements are normally inserted into PVC, FRP and stainless steel pipe. Shown in photograph is a 10” Diameter X 66” Long unit in PVC construction with 2-mixing elements and gas pull-down plate on the left feed side of the mixer to assure unreacted oxygen is contacted with the fracking water to be treated. Figure #7: The GV plastic mixing elements are available in diameters larger than 3” in Polypropylene, Kynar and PTFE Teflon® construction. 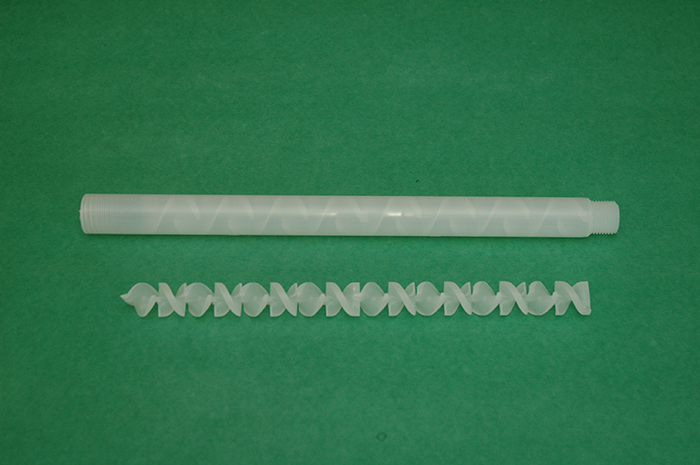 The mixing elements are normally inserted into PVC, FRP and PTFE lined pipe. 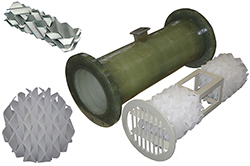 Shown in photograph is a 12” Diameter X 36” Long polypropylene static mixing element assembly with homogeneity spacer in the center and mounted in an FRP flanged housing. Figure #8: Medium Performance Type HT Helical static mixing elements create a reasonable quality mix in a long length at low pressure drop. Figure #9: Model HT-40 Helical static mixing element assemblies are available in sizes as small as 1.7 mm (0.067) to 4” diameter in Acetal, Polypropylene, Kynar and PTFE Teflon® construction. They are available as mixing element assemblies only for installation into standard plastic and metal housings or custom housings supplied by StaMixCo or the customer. Most sizes are standard stock items with shipment next day after purchase order. Figure #10: Model HT-11 Helical static mixing units are available with Acetal plastic mixing elements and high pressure Nylon housing with 1/4" – 3/4" NPT threaded end connections. 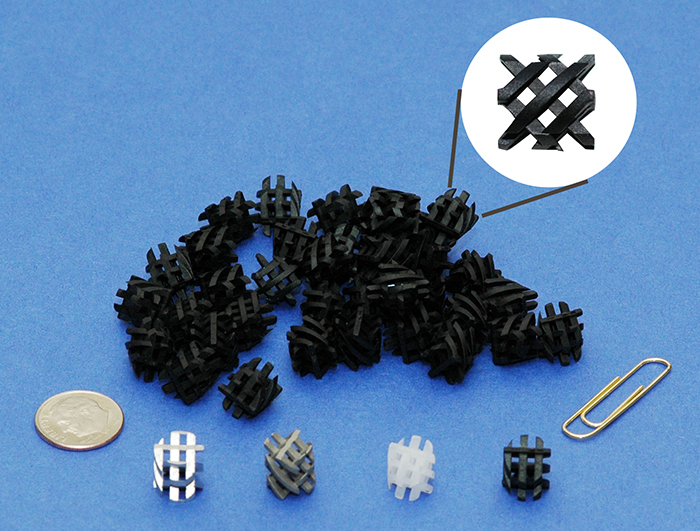 In sizes smaller than 1/4", they are available with plain ends. Most sizes are standard stock items with shipment next day after purchase. Figure #11: Model HT-30 Helical static mixing units are available with Acetal plastic & Polypropylene plastic mixing elements mounted in a honed Sch. 40 stainless steel pipe with threaded ends for use in applications operating at high pressure. They are available in 1/4" – 3/4" NPT pipe sizes. Most sizes are standard stock items with shipment next day after purchase. Figure #12: Model HT-10C Helical static mixing units are available with Polypropylene mixing elements and housing with a 1/2" Female NPT thread at the housing inlet (left-side photo) and 1/2" Male NPT thread at the housing outlet (right side photo). Units are standard stock items with shipment next day after purchase.